A retelling of ‘Sleeping Beauty’ from the point of view of the evil queen ‘Maleficent’ obviously sounded a great idea, coming on the back of commercial successes such as ‘Oz: The Great and The Powerful’, and I’d imagine this will do good business. To an extent, I think this is more a clear case of a film not being for me than it being particularly bad, but I didn’t enjoy it. The film stars Angelina Jolie as the title character, and she is the one reason worth seeing the film for – she’s truly excellent, ice cold when she needs to be, but not afraid to show a bit of emotion when the script calls for it. Unlike a lot of actors, she really gets the fairytale setting and there’s just enough scenery chewing without becoming annoying. The problem with the film is that everything around her isn’t nearly as interesting. The way the story is retold isn’t particularly interesting, and has sacrificed telling a darker tale (as the trailers and premise suggested) in favour of another sugary sweet Disney outing where the main character isn’t actually bad, just misunderstood. Personally, I don’t think it works in this context. The supporting cast is exceedingly bland as well, with Elle Fanning particularly disappointing as the princess, and the fairies more annoying than funny (kids may disagree). The ace in the pack is Sharlto Copley’s King Stefan, a classic Disney villain who is perfectly suited to acting up – it’s a performance that channels Alan Rickman in Robin Hood: Prince of Thieves, and it’s pretty enjoyable despite his lack of screentime. Overall, there’s a decent idea for a film here, but by pandering to the children in the audience, it’s sacrificed the interest and shading that Jolie could have clearly delivered with a better script. 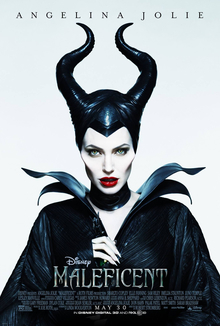 That may feel like a weak criticism (aren’t all Disney films aimed at kids), but the quality of children’s films recently have shown the ability to appeal to both adults and children, and unfortunately, Maleficent fails on these counts.